Revolution 2.0, a book on the Egyptian Revolution that deserves to be read. Left: Revolution 2.0. Right: Wael Ghonim. Photo: International Monetary Fund, Flickr. In Egypt it is not unusual to find elders concealing their pain with worn-out smiles, saying over and over, “Yes…The young people of the revolution are the finest generation this country has known.” And their smiles of approval are right. The generation that lead the revolution accomplished what thousands, if not millions, of Egyptians have been dreaming about for years. They stepped forward and broke the wall of fear that Egyptians had grown accustomed to living with from cradle to grave. 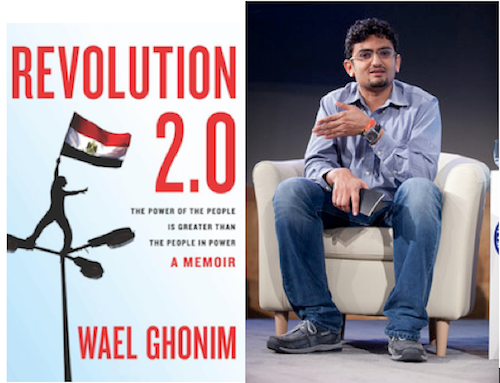 Among the hundreds of youths who were involved, the name Wael Ghonim stands out. Ghonim is a Google executive and administrator of the “We are all Khalid Said” Facebook page, which promoted the first demonstrations on January 25, 2011. He is responsible for the “El Baradei for President” page as well, but his name should also have a special resonance in the minds of television viewers. On the evening of January 27, 2011 Ghonim was kidnapped by Mubarak’s Homeland Security Forces and detained for 11 days. Upon his release, he immediately appeared on a popular Egyptian talk show in a state of exhaustion and depression. When pictures of young people killed by police forces during the demonstrations appeared on screen, the thirty-one year-old activist broke down. Between sobs he uttered: “I want to tell every father and mother that lost a child, I am sorry but it’s not our fault. It’s the fault of everyone who held on to power and clung to it!” After that he walked out of the studio while on live camera. Ghonim admires Ghandi and believes in peaceful resistance. A lot of his posts on “We are all Khalid Said” have been included in his book Revolution 2.0: The Power of the People Is Greater Than the People in Power (Houghton Mifflin Harcourt, 2012). In the folio-sized book’s 317 pages Ghonim narrates his life story, beginning with his childhood as a member of the aspiring Egyptian middle class and his fascination with computers and the Internet. He talks about his political involvement and the many young people who shared his dreams in smaller movements like The National Society for Change, Youth for Freedom and Justice, and The 6th of April movement, all the way up until January 25 and, eventually, the night Mubarak stepped down as president. In his book, Ghonim talks with certainty and ease about his political endeavors, devoting the majority of the content to details about his arrest and detainment. Revolution 2.0 provides insight into the life of a new generation that has earned the right to lead Egypt to freedom, justice, and dignity. Forcefully barricaded from the political scene for years, they are a generation that has paid the price in blood and imprisonment. Now the future is all for them.